I'm a sucker for a good jam, preserve, marmalade, or jelly. 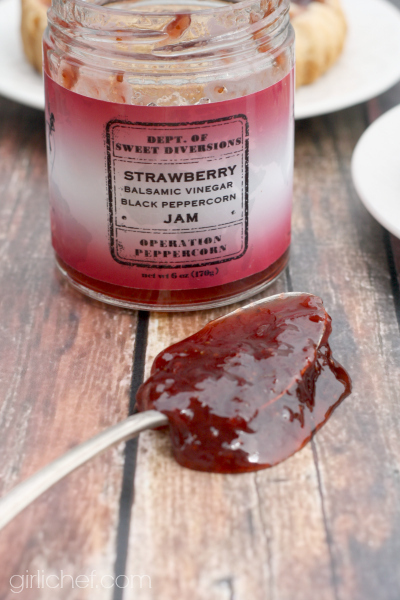 Pretty jars, intriguing flavor combos, handmade in small batches. I have far too many jars crowding my refrigerator. Although, that's probably because I don't ever want to let the last of it go. I find myself saving a wee bit in the bottom of a special jar...you know, for a special occasion or whatever. That special occasion usually just turns out to be a piece of really good toasted bread or a wheel of melty brie. So, when asked if I would like to try a jar of jam that uses locally sourced (within 12 miles of their kitchen) organic fruit from Department of Sweet Diversions, I couldn't resist. Seriously, I may have even tried. That go me exactly nowhere. With flavors like Strawberry Grand Marnier Liqueur Jam, Pear Vanilla Bean Chestnut Honey Jam, and Orange Dark French Chocolate Jam - can you really blame me? 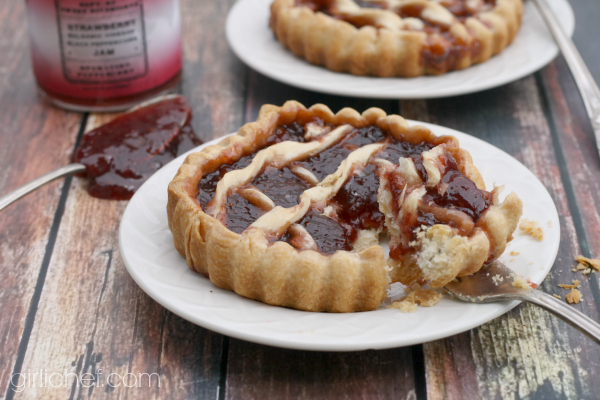 The flavor that I tried was Strawberry Balsamic Vinegar Black Peppercorn, and I used it in one of my favorite ways to showcase the flavor of a good jam - in a simple jam tart. Normally I make one large one jam tart, but instead I pulled out my smaller tart tins and made some minis. I found the balsamic and peppercorn aspects of the jam to be very subtle. Tasty yes, but definitely understated. I would have loved them to be a little more in-your-face. I think it would pair perfectly with some tangy goat cheese and crackers. It also would have been the perfect topper for a baked round of brie scooped up with some crusty bread. I'm itching to try the Pear Vanilla Bean Chestnut Honey Jam once it's back in stock! 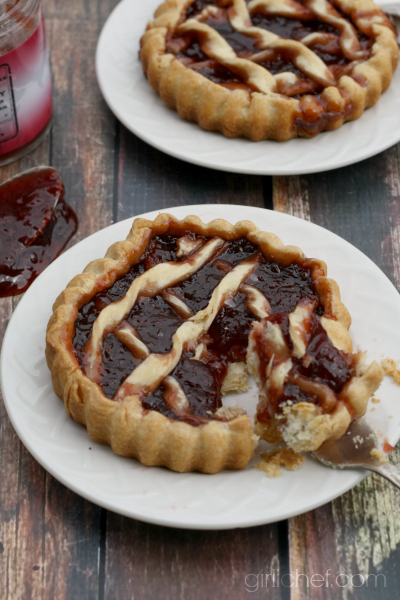 Whip up these mini jam-filled tarts using your favorite flavor of jam. Switch up the jam for a different tart every time. Mix the flour, sugar and salt together in a large bowl. Add the butter and work it in with a pastry blender or your finger tips until mixture resembles wet sand. Lightly beat the egg and yolk together. Add the eggs and vodka (or wine) to the dough until it just holds together. Be careful not to overwork or dough will be tough. Wrap in plastic and refrigerate for at least 1 hour. Roll out the dough on a lightly floured surface to an 1/8-inch thickness. Overturn two 4-1/2-inch tart tins (with removeable bottoms) onto the pastry and cut the pastry 1-inch wider around than the tins. Wrap the dough around a rolling pin, and lay across the (now right-side up) tart tin. Push the pastry into the bottom and up the sides. press down on the top to cut off the excess. Prick the pastry bottom all over with a fork. Divide the jam and spread over the bottom of the tarts. Gather up and roll out the remaining pastry on a lightly floured surface. Cut dough into 1/4-inch wide strips. Lightly twist and lay the strips in a diagonal lattice on top of the jam. Trim the strips to just inside the tart shell, then gently press the outside edge of the crust down over the ends of the strips (see example here). Bake until golden, ~25 minutes. Remove the warm tarts from the tins and allow them to cool on a rack. Interested in learning more about Department of Sweet Diversions Jam? Check out their website or connect with them on Facebook or Twitter. I received a free jar of Department of Sweet Diversions Jam. I was not compensated for this post. All opinions are my own.